The biggest news story of the last week was about Phil Robertson, a TV reality star who gave an interview to GQ. The interviewer eagerly solicited Robertson’s views on homosexuality, which turned out to be middle of the road. Robertson said that 1) the Bible disapproves of homosexual conduct, along with lots of other sins, and 2) he personally thinks women have a lot more to offer than gay men. The first proposition is indisputably true, while the second is plainly the majority opinion. 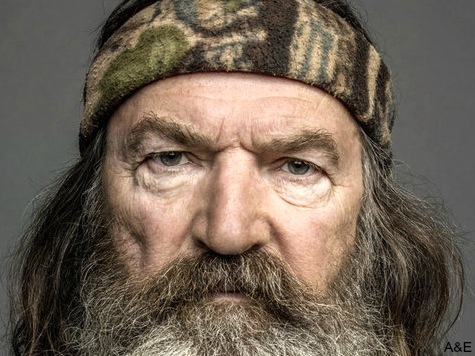 Nevertheless, Robertson’s interview was transformed into a purported scandal by the homosexual left, with the result that Robertson has been indefinitely suspended from Duck Dynasty. Of course, the next season of Duck Dynasty has long been in the can and will begin airing in a couple of weeks, with Mr. Robertson in a leading role. My cynical assumption is that his “indefinite” suspension will end in plenty of time to begin filming next year’s shows. All of which is very weird. The real St. Nicholas was a Greek who came from what is now Turkey. Ethnically, we would consider someone of Greek descent to be white. But does anyone care? 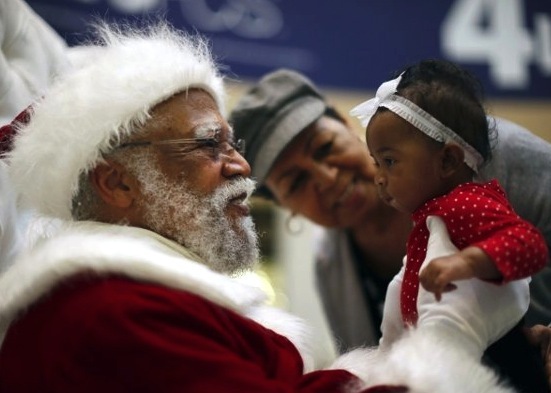 Department store Santas can be of any race, and I have never heard of anyone objecting to black, Latin, Asian or Native American Santas. The ethnicity of Jesus is a more significant point. Jesus was a Jew. This is more or less the whole point of the Bible, for those who believe in the divinity of Jesus. It isn’t really debatable, and “white” vs. “non-white” is utterly beside the point. Still, if Jews are not white, that is something of a news flash. It means that we need to recalculate all kinds of statistics relating to income and wealth. If Jews are black, we can say an immediate sayonara to affirmative action. It’s an enticing thought, but probably not what the “Jesus was black” cadre has in mind. Miss Sacco, a dedicated liberal, apparently was trying to make a point about “white privilege,” one of the dumber concepts of all time. But someone saw an opportunity for a lynching, and the rest is history. 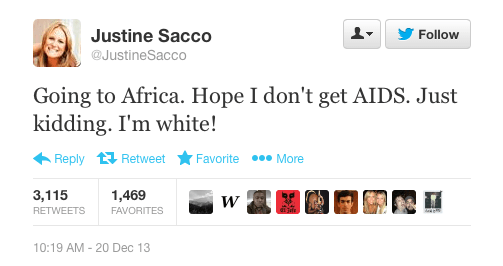 While poor Miss Sacco was still in the air, the hashtag #HasJustineLanded dominated Twitter. Her tweet was condemned as “racist,” and by the time her airplane arrived in South Africa, her employer had fired her. Miss Sacco groveled, issuing a ritual apology to her fellow leftists, but they were implacable. Her scalp has been mounted on the wall. What wall, exactly? The wall of political correctness, evidently. The Sacco incident reflects the fact that we are in the twilight of the era of “racism.” Racism is a very recent concept. I am not sure when the word was first used, but I believe it was during the 19th century when the idea emerged that it is bad to consider one’s own ethnic group to be superior to others. The concept of “racism” took hold only in the West. In Japan, for example, it is taken for granted that Japanese are superior to Koreans, while the Chinese have for millennia considered themselves to be superior to all others, and still do. Similarly, Arabs have always considered themselves entitled to enslave African blacks. Personally, I think the idea that one should not consider one’s own ethnic group to be superior to others is a good one. But that concept has been left in the dust here in the U.S. because it has little political utility: virtually no one disagrees with it. Nowadays, “racism” generally refers to opposing voter fraud, or wanting the federal government to balance its budget, or advocating enforcement of immigration laws. The word is now pretty much devoid of all meaning, and essentially, a “racist” is anyone who disagrees with a liberal. But poor Miss Sacco didn’t even get to enjoy the pleasures of heterodoxy: she was branded a “racist” for a failed attempt to express solidarity with the racial Left. Free speech, in general, is under attack. We live in an age of intolerance. 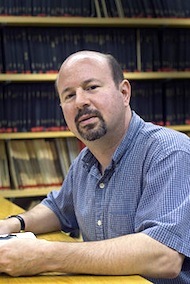 In addition to the instances cited above, National Review, Mark Steyn and others are being sued by Michael Mann, the global warming hoaxer, for taking issue with his bogus hockey stick. (Go ahead, Michael, you fraud: sue me too, if you dare.) Mark, NR’s resident genius, apparently has had less than full support from the magazine. [CLARIFICATION: I had a synapse failure here. Mark’s complaint about lack of support from NR related to his column on Duck Dynasty. NR has vigorously defended the Mann suit, and continues to do so.] Mark, if you ever need a new home, give us a call: 612.354.1239. Here’s the thing: saying what you think isn’t that hard. We do it all the time. Lefties can call you a “racist,” try to get you fired, or threaten you with violence. But are we men, or are we Pajama Boys? Here on the right, we are still men. (That includes our women, of course, most emphatically.) In reality, the leftists are almost always impotent to carry out their threats. And, if it comes to that, I am generally carrying; you should be, too. The Second Amendment defends the First. So screw them: we have a right to free speech, as long as we claim it, and use it. UPDATE: Thanks to those who pointed out that I had the wrong Michael Mann!